WE ARE OFFERING HALF PRICE STERILISATIONS OF BOTH DOGS AND CATS AS AN INCENTIVE TO REDUCE THE NUMBER OF UNWANTED LITTERS BORN EACH YEAR. MICROCHIPPING INCLUDED WITH A DE SEXING APPOINTMENT ONLY. 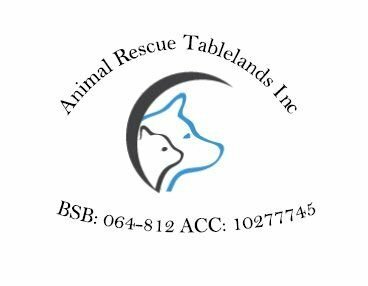 PLEASE CONTACT ANIMAL RESCUE TABLELANDS INC ON PH: 0487 430 443, FOR FURTHER DETAILS, IF YOU WANT TO INCLUDE VACCINATIONS ECT, PLEASE MENTION WHEN YOU MAKE YOUR BOOKING. ANY OTHER VET WORK REQUESTED VACCINATIONS, WORMING, FLEA & TICK TREATMENT ECT WILL BE CHARGED AT FULL PRICE WHICH IS ALSO A VERY REASONABLE COST. 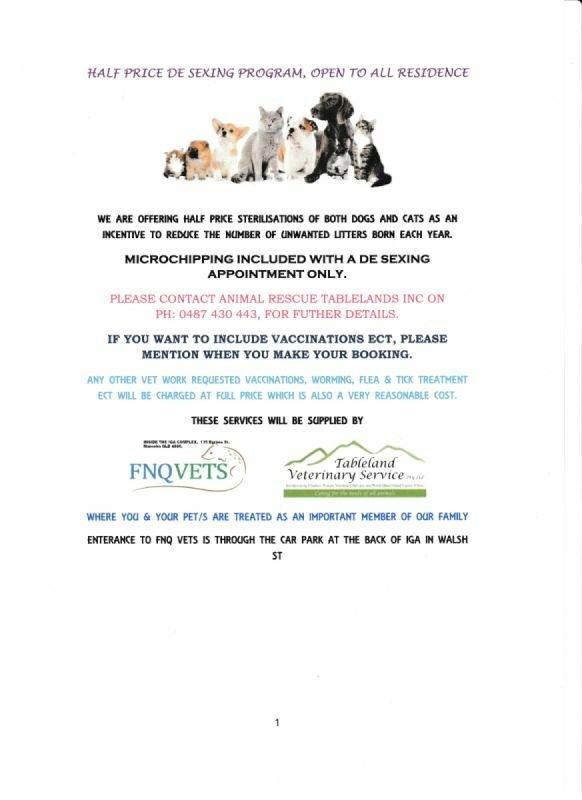 THESE SERVICES WILL BE SUPPLIED BY, FNQ VETS, MAREEBA & TABLELAND VETERINARY SERVICE ATHERTON, WHERE YOU & YOUR PET/S ARE TREATED AS AN IMPORTANT MEMBER OF OUR FAMILY ENTRANCE TO FNQ VET IS THROUGH THE CAR PARK AT THE BACK OF IGA IN WALSH ST, MAREEBA.